Brooklyn project, Computer Magic, released her album Davos earlier this year. The first single, Fuzz, is a spectacular synth-a-licious journey. You can buy Davos on iTunes. I made a remix of Fuzz that you can listen to and/or download here. The slick cover art is an illustration by designer, Johnny Gialanella. Thanks, Johnny. I was interviewed by Tucson Weekly's Brenna Bailey earlier this week and it was published today. Check it out here. Happy to announce that I'll be performing at MOCA in December. Join me when I perform at the Museum of Contemporary Art Tucson on December 5th. Writer, Annie Dickman, wrote a great article on my work that was published in today's Arizona Daily Star. Thanks to Annie, her editor Kathy Allen, and photographer Mamta Popat. A peek at Gallery Project's "Wish List." Gallery Project's Wish List exhibition opened last night. An old artist pal of mine, Anthony Fontana, attended the opening last night and texted me this image. My work, Horizon Pull (Draw a Line So Long It Can't Be Wrong II), is the projected video in the center of the photograph. Check it out if you can. If you don't catch it in Toledo, the exhibit will also be showing at the Ann Arbor Art Center later in the year. Nice Mention in Art F City. Art F City's Paddy Johnson and Michael Anthony Farley reviewed Baltimore's ARTSCAPE Art Fair, here. 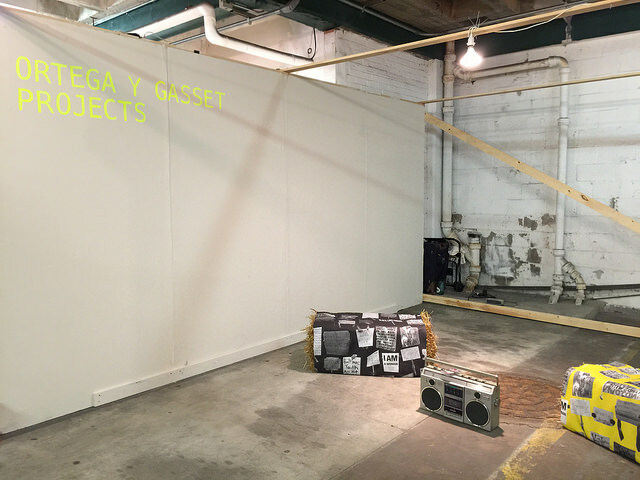 In a passage covering the Ortega y Gasset Projects booth they wrote, "For this project sound artist Joshua Bienko invited 16 artists to produce what appear to be genre-specific riffs for his album Always Already Here. This is the kind of project for which I set my expectations low, not just because there are so many bad tracks produced by artists but because it’s so hard to pull off. This, though, succeeds as art and music. Filled with catchy tunes in a range of styles—eighties girl bands, hip hop, banjo music—most of these riffs joke about anything from art to cats to children. Gary Setzer produces a Gary Numan-type track called Generator in which he sings about the emotional life of an artist. “I have anxiety…What is this that I have made? I have not made anything!” he laments against the bubbly notes of his keyboard." Those of you that know me, will know that the Gary Numan comparison made my day. Always Already Here, Vol. 1. The Brooklyn artspace, Ortega y Gasset Projects, will have a booth at ARTSCAPE, Baltimore's Artist Run Art Fair (July 17 - 19th). Numerous sound works, including two of my own, will be featured there. The works will also be for sale on a limited edition cassette called Always Already Here, Vol. 1, produced by fellow artist and musician, Joshua Bienko. The cassette contains sound works by numerous artists including Bienko, Mel Chin, and many others. Pattern designed by Lauren F Adams, 2015 for “Always Already Here, Vol. 1,” a mixtape produced by Joshua Bienko.